Apollo is one of the most handsome, dazzling, and charismatic Gods of the Olympian Pantheon; he is blindingly good-looking and had many, many lovers, both male and female. Apollo shone so brightly he overshadowed Helios the Sun God, and eventually became known as a Sun God in his own right. One of Apollo's most important daily tasks was to harness his four-horse chariot, in order to move the Sun across the sky. He is also the God of music, truth and prophecy, healing, plague, and poetry. Apollo pursued and conquered many women, both mortal and divine, though many of his would-be female lovers ran from his advances or committed suicide rather than submit to him. Apparently Apollo was capable of absorbing the power of his lovers and Goddesses, Queens, and Princesses certainly didn’t want to become a lesser being even for one as beautiful as Apollo. He had better luck with male lovers and is the patron of young men, teaching them music, sports and divination. 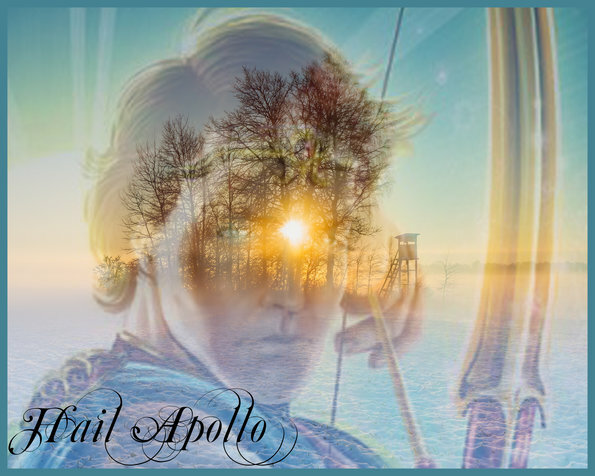 Apollo is the son of Zeus and Leto, and has a twin sister, the chaste huntress Artemis. Zeus was at it again, cheating on Hera his wife, with Leto. When Leto became pregnant, Hera was furious and decreed that Leto could not give birth on land. Leto fled the wrath of Hera and ended up on the isle of Delos, which was a newly formed island, and therefore not considered to be actual land yet. With the help of Artemis who had been born the day before, Apollo was born. Eventually Leto returned to Delphi with Apollo where he killed Hera’s ally the Guardian Serpent, and absorbed its power. Apollo could then manifest as a snake. Apollo was a great healer, but he was also capable of unleashing epidemics at will. During the Trojan War Apollo attacked the Greeks with the plague. He can heal anyone except those he has killed himself. Apollo is also the healer of the Spirit World, healing them whenever they are ill. The gift of prophecy was given to Apollo because of his truthfulness, integrity and loyalty to those he loves. He became the prophetic Deity of Delphi, where his priestess Pythia would channel his divinations of the future to the hordes of people who travelled from throughout the known world to learn their fate. As a patron of music, Apollo possessed a lyre that was made for him by Hermes. He was often accompanied by the nine Muses who were known for inspiring art and music. Apollo was a masterful musician and delighted the Olympians with songs played upon his golden lyre.